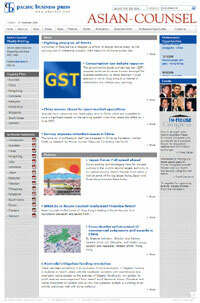 Pacific Business Press have launched their new feature-rich website this month. This website uses a Content Management System with PHP programming and a MySQL database management system, and comes complete with Event Registration and a Jobs Ticker. Pacific Business Press have also used Compelite's services for their eMarketing campaigns. Compelite have proven eMarketing solutions which make it easier to create, distribute and also get valuable feedback – including who read them and which links they visited. This will help improve future editions and direct specific company information and marketing towards interested recipients. Founded in 1998, Pacific Business Press has quickly carved itself a unique niche in the international legal conference and publishing industry. The company is also the publisher of Asian-Counsel, the corporate counsel journal for the Asia-Pacific region and official publication of the In-House Congress circuit, the Asian In-House Handbook, Asia's Essential In-House Resource, and the weekly email Deals and Moves Briefing.